You may be familiar with the Pin feature on Internet Explorer, which allows you to pin sites to your taskbar. Since this is a very useful and liked feature on Internet Explorer, developers are now pushing more amazing add-ons on the Internet Explorer gallery. Taking this into consideration, Microsoft has decided to simplify the process of downloading these add-ons and pinning sites to your taskbar, to a new level. The Internet Explorer Gallery has received a lift – with a much simplified process of pinning any add-on to your task bar. Here are the two features that have been introduced for better user experience. Easy way to find Tracking Protection Lists. If you would just recall the way you would pin the sites, add-on’s to the task bar, it would be by dragging the tab from top of the browser to the task bar. Now things have changed, the new Internet Explorer gallery has the feature of “Dragging icon to your taskbar to pin the site”. All you have to do is drag this icon to your task bar. That’s it, simple as that. 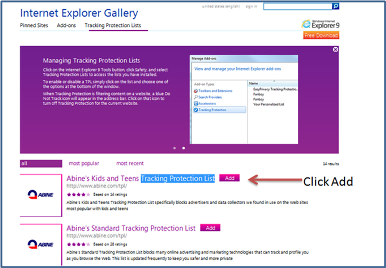 The other feature added is the “Easy way to find Tracking Protection Lists”. This helps you to find all the protection list add-ons on one page. Just click the “ADD” button on the list available, the add-on gets installed right away. Now that is what I say is something really cool. 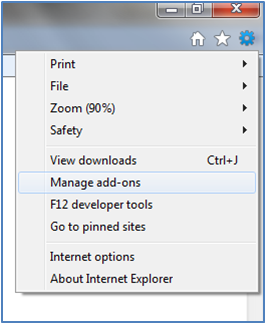 You can always manage add-ons installed on Internet Explorer by clicking “tools” tab and then manage add-ons. You can disable and enable add-ons right away from this panel just as shown in the image below. Experience the new Internet Explorer Gallery here.